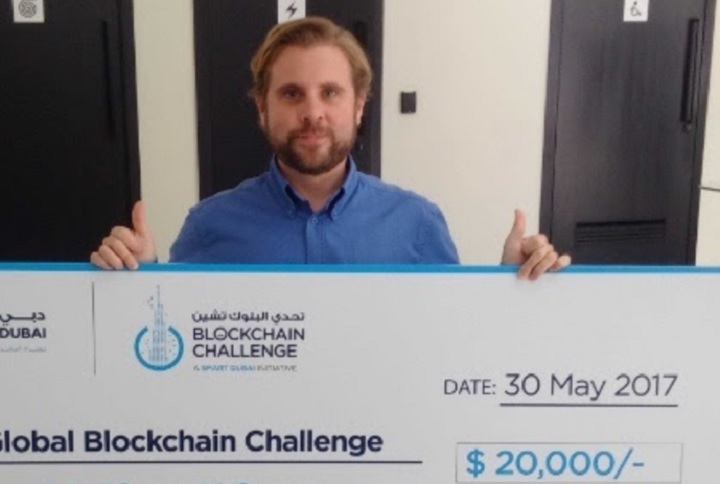 On May 29th I pitched the Sun Exchange to an esteemed audience in Dubai as part of the Smart Dubai Office Global Blockchain Challenge that we were invited to attend. We were competing against 20 other businesses from all over the globe working with blockchain technology and we won 1st place and a modest cash prize. For anyone that has been following Sun Exchange for a while you may be intrigued why the Dubai government would be so interested and impressed by an application that was built for electrifying Africa. The answer is obvious when you lift the hood on what we are building and learn about Dubai’s ‘smart-city’ aspirations. Dubai has ambitious plans to become the world’s 1st 100% blockchain powered city so to increase department efficiency and increase trust. And they want to do this by 2020. Dubai also has a target of being 7% powered by clean energy by 2020. The Sun Exchange can help them achieve both these goals at the same time. The Sun Exchange is a platform built so that anyone can own remotely located solar panels and earn income from them. To drive this we have built a blockchain framework that can move solar energy value around and keep an immutable record of ownership and earnings whilst enabling regulators to enforce toll fees through smart contracts. The Sun Exchange blockchain application enables energy regulators to remain relevant in a world where both prosumers and consumers are generating and buying electricity from distributed rooftop solar plants, which in itself is a disruption of the traditional energy model. Through Sun Exchange it is possible to have distributed energy generation with distributed ownership - anyone in a city can now own solar assets. Someone living in a Dubai skyscraper can through Sun Exchange own a solar panel on the roof of a school somewhere else in the city and earn solar powered income from it whilst lowering the energy bills of the school. The city of Dubai gets to eliminate the complex administrative burden of monitoring and billing both parties as the billing is being run on an autonomous blockchain payment system. The solar data is also publicly viewable so it can provide reliable data for research and grid management purposes. In short, Sun Exchange has built the enabling technology for smart grids to function in a blockchain powered world. And that is why we won the Global Blockchain Challenge.